"Renowned for his dramatic floral installations and eye for colours and details, Simon Nickell is one of the most revered and watched florists in the UK, setting and predicting trends”. Wedding Flowers and Accessories Magazine. From boho-luxe, through luscious tablescapes to extravagant arches.The largest scale or tiniest detail, in colours from classic white and green through the boldest statements to match your vision. Helen’s influence comes from English herbaceous borders. She’s equally delighted when creating a tropical paradise. The Velvet Daisy serves London, Local and International clients. It’s unique dedicated London-Country, Country to London allows for consultations in London and the West Country. 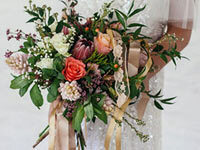 Roberta is a floral stylist working on big and small weddings across the South West. Designs are bought to life in her workshop on her farm in mid Devon, where she grows many flowers and forages for seasonal foliage. You will have her undivided attention helping you plan your wedding and her flowers will breath life and colour into your day. 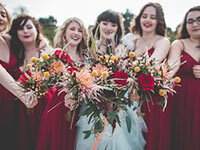 With a particular focus on composition, colour and sustainable sourcing, her flowers and wedding service is utterly unique. 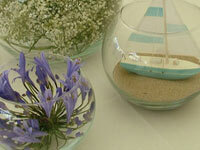 The choice of flowers for your wedding is never easy but carries with it great importance. That is why at Fleurtations we offer a truly bespoke service from start to finish. We understand that everyone’s needs are different and with that in mind we do not offer “wedding flower packages” but rather aim to work with you and within any budget you may have. With our experience and expertise we will offer ideas and solutions to fit into any chosen colour scheme or theme that you have chosen for your big day. 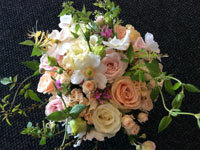 George is a simply stylish creative designer who enjoys sharing her love of flowers with her happy clients. 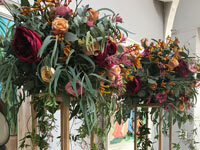 In the past decade George has worked on hundreds of diverse weddings while doing weekly flowers for Rick Steins. Enjoying a natural versatility and a deep knowledge of her art, she is as at home decorating a castle as a tipi. Working from her studio in the middle of Cornwalls flower farms, George focuses on providing her clients with a personal, friendly and professional service. 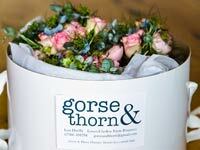 If you’re looking to wed in West Cornwall, Louise of Gorse & Thorn offers a winning combination of professionally trained florist and flower grower. 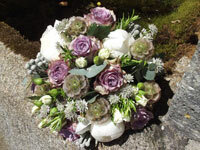 She loves to share her in-depth knowledge of flowers and plants and a natural flair for colour. From choosing a colour palette, how to use seasonal local flowers or achieve wow factor blooms, she works closely with couples to develop ideas which reflect their personality and style. Her carefully crafted floral designs are a true celebration of colour, texture and scent. Her skill is in getting every floral detail right, from a tipi chandelier right down to a single petal in the bride’s hair. Offering a friendly, relaxed & professional service, Alice prides herself on understanding exactly what the client wants, enhancing their ideas with a wealth of creativity and flowery knowledge! Her style is natural, loose & elegant with a modern-romantic feel. Known for her care, consideration and going the extra mile, she will not only deliver stunning flowers to enhance your day, she will be there for you every step of the botanical way. 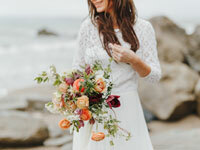 Alice loves working with beautiful, blousy blooms along with locally grown flowers & foliage, foraging in nature for those unique pieces to really add something extra to your designs. Sweet Pea Floral Studio owned by Lin Turner who simply adores flowers, her style is natural yet elegant using a varied colour palette of colours and flowers that reflect current trends. Lin is inspired by scented blooms, garden roses, herbs, succulents and lots of foliage’s sourcing locally grown blooms where possible. 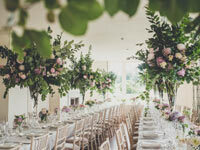 The creative team at Sweet Pea take enormous pride in their work and with Lin’s sense of style and friendly approach Sweet Pea Floral Studio is an obvious choice for gorgeous bespoke wedding flowers. Ellie Rose's floral creations at the Flower Press take inspiration from the wild and untamed landscapes from her home in Falmouth. Hedgerows, meadows, moors and the coast have always evoked joy, which translates into beautiful natural and rustic style flowers for your wedding or event, specialising in dried flowers for a unique and quirky addition to any bouquet or arrangement. 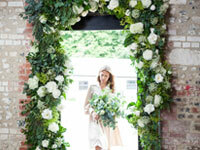 Voted one of Tatler’s top 20 UK florists; Becca is the creative owner behind the garden gate flower company. Her passion for design and creating beautiful events is coupled with the unique approach to seasonality. Becca and her team use only British flowers including those grown in her garden at Duchy of Cornwall Nursery in Lostwithiel. Using carefully chosen, beautiful flowers to design the perfect arrangements which reflect the seasons and your style. Because they grow their own, the flowers and foliage they use are always 'just picked'. They can grow unusual and delicate flowers you just can't find 'on-the-high-street'. Becca and her team are always interested in hearing your ideas and weaving these together with the flowers to create individual, natural, wild and wonderful arrangements for weddings across Cornwall and beyond. 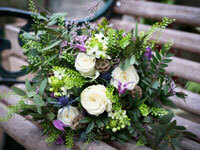 Specialising in natural, rustic and beautiful. Twigs & Greens, run by Jen, promotes local, informal and unregimented floral designs. Her ethos and style is loose, organic and botanical, with a nod towards flamboyant. She has a passion for weddings and has a knack for understanding; people & requirements, so you know that every last detail of your wedding flowers will be looked after. Escential Blooms is all about the personal touch. Kirsty prides herself on understanding and interpreting your floral wishes and wants into perfectly bespoke wedding flowers that are as individual as each bride. As an award winning florist, Kirsty devotes her time designing, tailoring and sourcing flowers for each Bride and can be as involved in your day as much or as little as you like, from accessorising your floral style to helping with logistics on the big day.